The Matrimandir wants to be the symbol of the Universal Mother, according to Sri Aurobindo’s teaching. In India for centuries the creation, that is basically the working of the creatrix Mother, has been considered as anti-divine. Sri Aurobindo taught that it is in matter that the Divine must be manifested and has insisted on the understanding of this notion of the creatrix Mother, the female who brings forth. Matrimandir is to teach people that it is not by retiring from this world nor by ignoring it that they will realize the Divine during their lifetime. Indians, for the great majority, do not need any explanation, they understand it because of their culture. But only one Westerner out of a million will understand that such a building is necessary. It will be a kind of hall like the inside of a column, a tower with twelve facets, each facet represents a month of the year. Right in the center on the floor is my symbol, and above it four of Sri Aurobindo’s symbols joined to form a sblockquoteuare, and above that a globe of 70 centimeters in diameter. People will not come for regular mediation or anything of that kind: it will be a place for concentration, for trying to find one’s consciousness. The Mother selected the outer form of the Matrimandir design from various models presented to her in March 1970.The main structure is a flattened sphere, 36 meter in diameter by 29.5 meter in height, within located the Inner Chamber visualized by The Mother.Around the Matrimandir sphere twelve meditation rooms are located inside twelve petals which extend to the edge of twelve surrounding gardens radiating out from the Matrimandir. An additional garden called the Garden of Unity is dominated by a large Banyan Tree, the geographical centre of Auroville. Close by is an open amphitheater with the Urn at its focal point which was built for Auroville’s inauguration ceremony in 1968. Excavation for the Matrimandir foundations began in March 1971, with some Aurovilians and a number of other workers who undertook to build Matrimandir without paid labor, putting their whole heart into it. But several months later it became necessary to invite local villagers to join them on a salary basis in order to speed up the work. build it; I will make it a very strong center, but only those who are capable will perceive it. 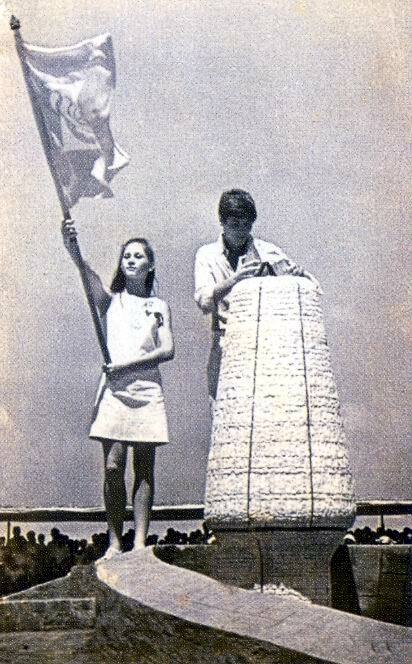 One year later, in February 1972 the first load of cement was poured into 14,000 cubic meter hole. 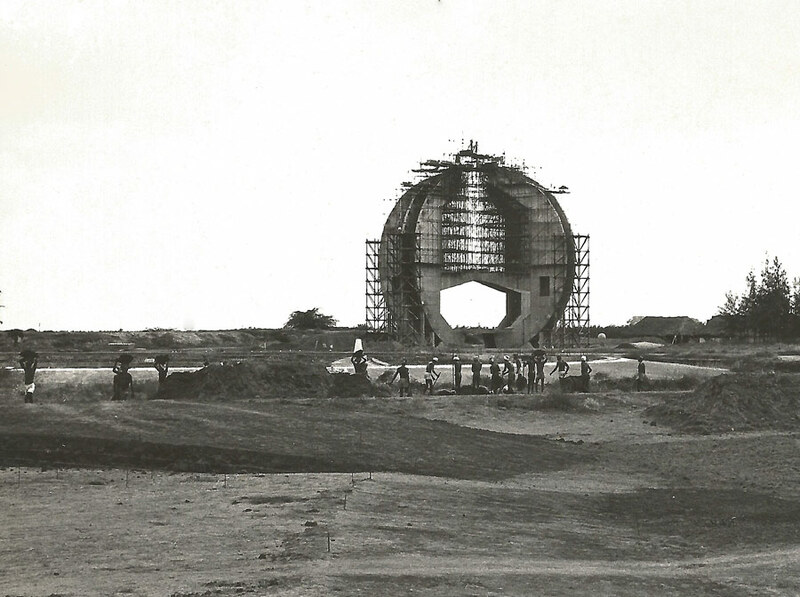 On the 17th November 1973, at the exact time Mother left her body, the Aurovilians completed the concrete ring linking the four pillars which support the Matrimandir. From then on the construction continued in a very regular manner, without any halt, progressing according to the rhythm of the dedicated team of workers. In 1994 the Inner Chamber, though not fully completed at the time, was opened to the public. The main sphere of the Matrimandir was completed in 2009, barring a few remaining details, but the gardens will take a few more years and the planned surrounding lake considerably longer. The general layout for the garden area is more or less finalized, though the size of the lake and sourcing of the water needed to fill it has yet to be decided.The Amphitheater fully covered with red Agra stone, is regularly used for late afternoon gatherings of a meditative nature; also as a site for a pre-dawn bonfire on Auroville’s and Sri Aurobindo’s birthdays.